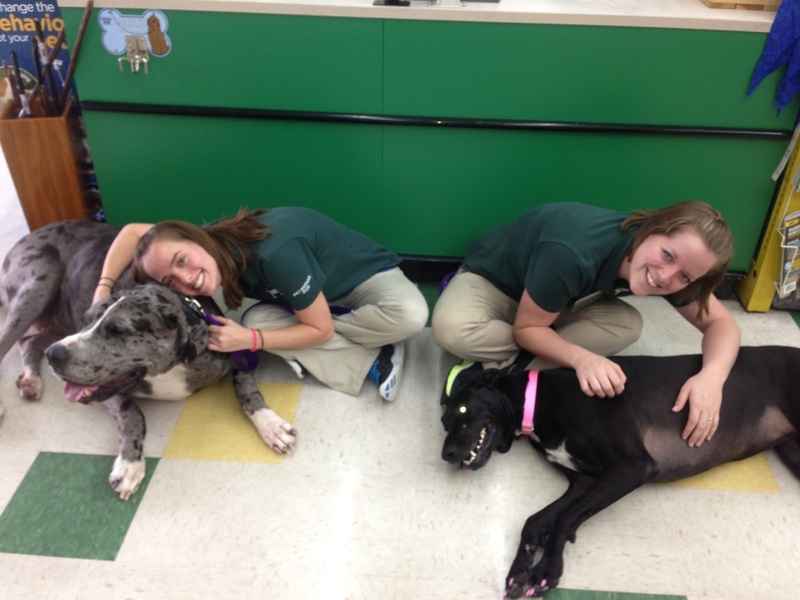 Pawsitive Impressions: Great Danes + Neighborly Service= Winning Combination! 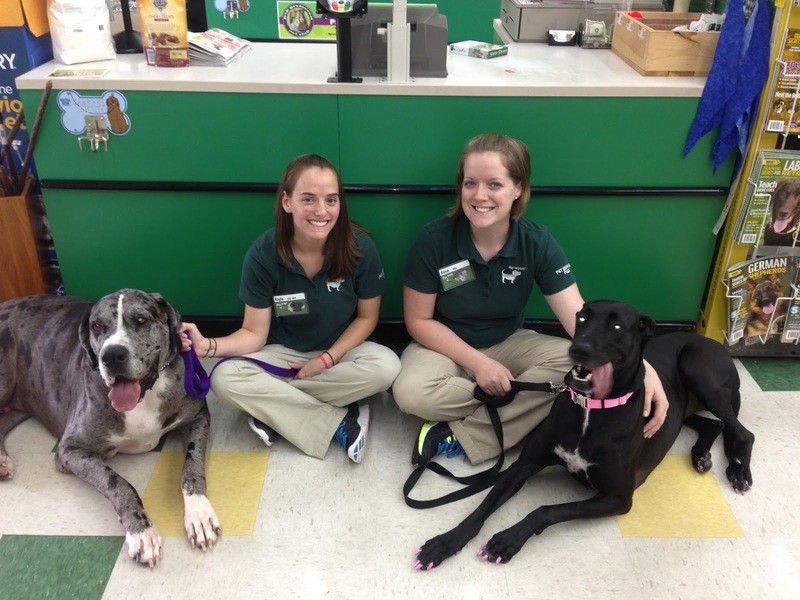 Great Danes + Neighborly Service= Winning Combination! This letter is incredible! Look at the words the neighbor uses to describe his experience at the Brunswick, GA pet center. Alicia and Kayla deserve a BIG pat on the back for creating a NEIGHBORLY experience that not only the neighbor loves, but also his adorable Great Danes. p.s- check out the pink toe nails and the matching pink collar! I am writing to notify you about the exemplary employees and service that you have at the below identified store. I frequent this store usually once a week with my two dogs to purchase treats, toys and/or other items for the dogs. All the employees that I encounter in this store are extremely courteous and friendly. Two employees stand out among the rest. They are Ms. Alicia Wooten and Ms. Kayla Martin. I believe that both of these employees have recently been promoted. If so, I’m sure it is due to their exceptional performance and the personal attention that they provide to the customers. Since I usually have my two dogs in tow when I go to the store (both Great Danes), the dogs are a handful especially when other dogs or cats are visiting the store with their humans. My dogs get so excited when they see either one or both of these ladies. Both of these ladies are very friendly and courteous and unusually and extremely helpful to me. I can’t stress enough how much help these ladies have been to me during my visits to the store. With the two giant dogs in tow (usually me being towed by them) it is difficult for me to maneuver a shopping cart and to shop for the items that I plan to purchase. Ms. Wooten and Ms. Martin (whichever one is on duty at the time) always help me by getting the merchandise that I’m looking for and carrying it to the checkout counter for me. They often go to the store room and get additional quantities of the items that I want to purchase if there aren’t enough on the shelf or so that I don’t have to empty the shelf of a particular item. Both ladies usually carry my purchases out to my vehicle for me since I’ve got the two giant dogs to get across the street and through the parking lot without any of us getting run over. My congratulations to Pet Supplies Plus for finding such enthusiastic, personable and hardworking employees like Ms. Wooten and Ms. Martin. It is because of these two ladies exceptional customer service that I quit shopping at the other pet store in Brunswick. Please commend these employees/ ladies for their exceptional customer service. They are a credit to and terrific ambassadors for the Pet Supplies Plus brand. Great Job Ladies!! Major props to my fellow sister store for this incredible letter! Outstanding job Team!! What a great example of engagement, it’s contagious and inspiring!! Lew comes to the Rescue of a Picky Pup Parent! Growl-free Returns Generate Loyal Neighbors! These girls are ready for their treats!